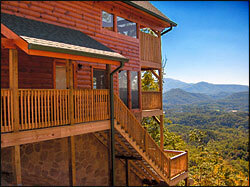 If you don't know about Starr Crest Resort cabin rentals in the Smoky Mountains you certainly should. They feature some of the nicest, most luxurious cabin and vacation rentals in the entire Gatlinburg and Pigeon Forge areas. And the cabin pictured to the right known as Champion's Run at Starr Crest Resort is a luxury 2 bedroom 2 1/2 bath cabin that will pamper you with incredibly luxurious amenities like 3 decks and a beautiful view of the Smokies. You should see the pictures of this beautiful vacation rental nestled high up in The Great Smoky Mountains. Champion's Run is a 3 story log cabin that is located only minutes from Pigeon Forge shopping and attractions like Dollywood and only a few minutes more away from the downtown Gatlinburg shopping and attraction area and the entrance to The Great Smoky Mountain National Park. While in the national park you can enjoy more than 850 mils of hiking trails, beautiful scenic drives like Cades Cove and historical and educational stops like the main entrance visitors center. Make sure you pick up a map at the visitors center so you don't miss any of the most popular destinations and so you won't get lost in the Park's more than 500,000 acres. After you get through spending the day enjoying the fun and sights in the vacation capital of the Southeast, you get to come back to your Starr Crest cabin rental and relax while you enjoy some of the cabin's many amenities. I mentioned a few above, but there are many more. How does sitting in a hot tub while enjoying the beautiful view sound? You can also enjoy other luxuries such as beautiful log cabin decor and furniture, a pool table, a foosball table, a Jacuzzi bath, multiple televisions including a big screen TV in the living room, a gas burning fireplace with beautiful stonework, rocking chairs on the deck, a fully stocked gourmet kitchen, a DVD / VCR player, a washer and dryer, a 2 person sauna, access to the local swimming pool and the list just keeps going on. Champion's Run will sleep up to 6 adults and rents for between $239 per night to $329 per night. Spend your next Pigeon Forge or Gatlinburg vacation here and you will have memories of your Smoky Mountain vacation for many years to come.